A spin-off from the ‘X-Men’ franchise that delivers a grown-up ending to a seventeen year long film journey. The film takes us to the year 2029 where mutants are now a tiny minority, the X-Men no longer exist, and what remains of the once mighty Wolverine’s life is bleak and hollow. Working odd jobs and drowning himself in whiskey every night, the heroic and complex character of Logan has reverted back to the opaque, angry character we first met at the beginning of ‘X-Men (2000)’. More distressing is that somewhere in a warehouse across the Mexican border, Charles Xavier is rotting in a hospital bed, sedated and confused. It takes a while for the jigsaw to come together about how these two heroes went from a mansion in Winchester to a tin-shed in Mexico, but their “routine” is broken by the arrival of Laura, a young mutant who displays abilities similar to that of Wolverine. She is wanted by a government agency who carried out tests on her; which is the same, old, reliable, narrative arch used in every ‘X-Men’ film (with the exception of ‘Apocalypse’, perhaps). Together, Wolverine and Professor X work together to try and get Laura to safety. A commendable and original feature of this film when compared to the rest of the franchise is that it is massively action-based, but the fighting is real – there are no fire-breathers, telekinetics, cloud-gatherers – even Charles has lost control of his powers, so we are left with Wolverine and his fists/claws. 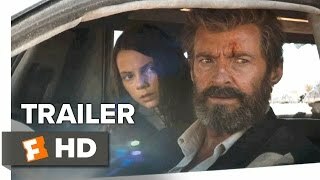 What makes ‘Logan’ more than an adrenaline fuelled, action-packed, punching and killing Hollywood blockbuster, is seeing an end to the characters that we have grown-up with in the most unexpected way. As an ‘X-Men’ fan who owns all of the films; but has never really bothered with the “Wolverine” spin-offs, I was content with how the story has been brought to a close. ‘Logan’ did not deliver a tale of heroism or a glowing memorial to the stories I have come to love, but it did deliver a spin-off that can stand on its own merits, with another splendid performance from both Hugh Jackman and Sir Patrick Stewart. Finally, I would just like to say that the very last scene of this film poked me in the chest because as they say: “X marks the stop”.